I'm looking forward to South by Southwest next month, in Austin. Of course, I'll try to post notes and/or audio afterward. The full SXSW Film panel schedule is here. 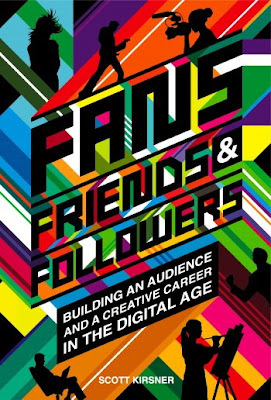 I will also be doing the pre-release for my new book, 'Fans, Friends and Followers,' at SXSW. I'll have a few early copies for sale, and will be doing a signing at the SXSW Bookstore on Monday, March 16th at 1 PM. I'm out in LA this week, and I've been having lots of conversations on the topic of content creation for the Web. Imagine you are successful in TV or film. You're making six figures a year (if not seven figures), and they let you play with the big cameras, on the big soundstages. You have big budgets and big crews. Why on earth would the prospect of making $25,000 for a Web series sound appealing? That's why the opportunity exists, for the young and hungry, to define how storytelling will work on the Web... to establish the ground rules of how you build a big audience and interact with them... and to figure out the business models that will turn small money into big money. I was on the campus of USC tonight, talking with a number of students, and it seems to me that if you're entering the entertainment industry right now, you have this choice: do you want to follow the path that successful people have walked, where you start by working as a gofer or production assistant and over a decade or two work yourself up to the point where they let you make shows for TV or feature films? Or do you want to pioneer something entirely new? At the panel I moderated tonight, Evan Spiridellis from JibJab Media had a great line. As he was beginning to make animated films in the 1990s, and starting to enter them in film festivals, he and his brother Gregg started to notice that the Internet seemed to be gaining momentum, and seemed to have some creative potential. Gregg asked Evan, "After you've seen the Model T, do you really want to keep making horse shoes?" Meaning, if you can see where things are headed... why keep doing the old stuff? One answer is, because you're making a good living at it. This week's edition has me talking about technology's role in the cinema, and the Science and Technology Academy Awards, handed out earlier this month. You can listen to it or download it here. I think this is very good news: YouTube is now testing paid downloads. If you want to pull down a high-res, MP4 copy of a video from the site (which will play on an iPod), you can pay to do so. No word on what percentage of the revenue goes to the creator. But the one way to pay for videos is Google Checkout, Google's own PayPal-like payment system. YouTube is currently only testing this with select partners. Wired News notes that the files aren't DRM protected, which will mean that big media companies will likely be leery of the system. Here's an example of a video that can be downloaded as an MP4 for 99 cents. You may recall that for a while, Google Video allowed content creators to charge for video downloads -- a service they abandoned in 2007. I ran into someone last week who said that that had been a good source of revenue for them, selling docs and educational films... so perhaps they'll give YouTube's new offering a try. Just wanted to post some rough audio from today's panel on "Outreach & Connection" -- how filmmakers can effectively build an audience for their work (captured with my little Olympus digital voice recorder). This was part of the 2009 Making Your Media Matter conference organized by American University's Center for Social Media. And moderating was Wendy Levy, Director of Creative Programming at the Bay Area Video Coalition. Here's the MP3 file... or just click play below. It's about 90 minutes long. What's the Right Word for Those People Formerly Known as the Audience? I'm down in DC today for the excellent 'Making Your Media Matter' conference... and I will try to post some audio later today from a panel that just took place about outreach, marketing, and audience-building. Afterward, I wound up talking with some of the conference participants about terminology. They may help finance your film. They may help contribute research to a documentary...or suggest people for you to interview. They may help scout locations for a narrative feature. They may submit footage or edit sequences that wind up in the finished film. They may post comments on your blog, or video responses to your YouTube channel. They may submit a song that winds up being part of the soundtrack. They may help you spread the word once the film is available on DVD or as a digital download. They may review it on Netflix, Amazon, or their own blog after they've seen the DVD. Is the term "audience" outmoded? The audience used to be a cinema full of passive, hopefully appreciative, consumers of your work. Obviously, a big chunk of people who see your film will still be passive -- they watch it in a theater, on a TV, on an iPod, and do nothing else. But some percentage will be much more active and engaged. Are they patrons? Collaborators? Your community? Your supporters? Co-conspirators? Team members? Partners? Associates? I'm asking: what term feels right for you? A lot of times when I've written about some interesting little Internet experiment that has generated $50,000 or $100,000 for the creative person behind it, someone will e-mail me to ask, "Yeah, OK, but how does that support the media industry? A movie studio can't pay its security guards for a week on that kind of money." I'm less confident that it will support the same gargantuan, diversified companies that raked in the big bucks in the days when there were only four TV networks, six movies released every weekend, a dozen important records issued on Tuesday. This David Carr column from today's NY Times is worth a read, because it highlights this issue: the wind is right now at the little guy's back. The piece focuses on the music industry, but it could very well be about movies or book publishing, or any other media endeavor. One example it cites of an individual artist figuring out a way to get by in this new environment is Jill Sobule. I've been a fan of hers since the mid-1990s, and I had a chance to interview her for my forthcoming book. Knowledge@Wharton: Several numbers have been quoted regarding the overall cost of "Dr. Horrible" -- "low six-figures"; "around $200,000" -- can you set the record straight? Whedon: ...A lot of people sit around and go, "How can I get this made?" The only answer is: By making it. By borrowing someone's camera. By buying a camera. They come cheap and they work well. And if you know where to point them -- and the person that you point them at is saying something interesting -- that's it! That's how it works. If they want to sell it, if they want to make a lot of money, they can do that -- and they can kiss their story goodbye. Because, in general, that's the last they're ever going to see of it, because somebody else will own it and they will either not make it, or make it very differently than that person hoped. Worth a read today is this Wall Street Journal piece on how Internet video sites are allowing users to annotate videos and embed links in them. The new editing features have spurred the appearance of more online videos in which users control the action. For example, a series called "The Time Machine" on YouTube is made up of nine videos that follow three 20-something characters -- Chad, Matt and Rob -- as they battle dinosaurs, zombies and bad guys en route to a business meeting. At the end of each roughly two-minute segment, viewers can click on links embedded in the video and choose what the characters do next. That takes them to another video, where the characters continue their journey or die, ending the game. Since its October launch, "The Time Machine" has garnered nearly three million views. ...The appearance of the new video features represents the next step in how the Internet is used. While people before could only turn up the volume or click on a larger screen for online videos, they can now use the format to engage with friends and fans. That makes online videos part of a larger entertainment movement -- where users control the medium, interact with others or have the sense of "being there," as in the cases of Internet-connected TVs and videogames, as well as live events shown in 3-D at movie theaters. Here's Episode #1 of "The Time Machine"